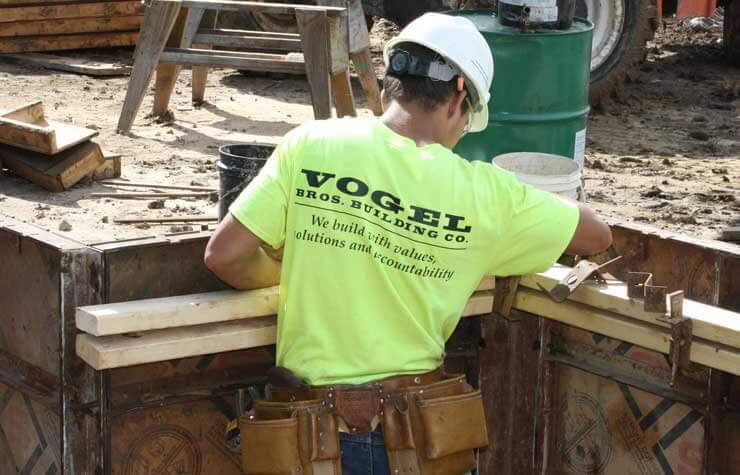 Services & Delivery Methods | Vogel Bros. Building Co. Transforming your vision into reality. 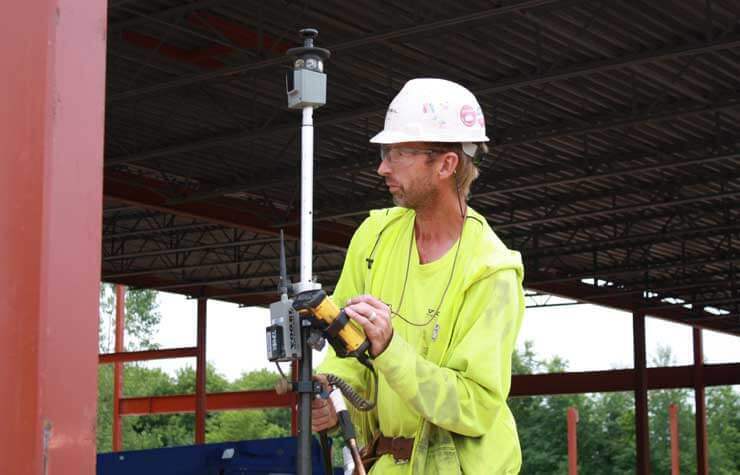 Getting us involved early allows us to maximize our service value for your project by seeking innovative solutions that respond to the specific conditions of the site. Don't worry about managing all the details. We will take the lead and manage your team of design experts; providing solutions that are accountable to your goals, budget and schedule. Driven by our company culture, our attentive, organized project managers and superintendents focus on giving you an outstanding construction experience from planning to closeout and warranty. Full-time site and safety management; subcontractor prequal; bidding and procurement; comprehensive scheduling; self-performed carpentry, concrete, and selective demolition; quality control; commissioning and verification; closeout and warranty management. No project is too small. From fixing a door or renovating your restrooms, to tenant build-outs or managing unique confidential projects, we offer a wide range of additional services to support all your project needs. Immediate service calls; limited scope renovation/remodeling; emergency facility repairs; preventative maintenance and repair programs; secure and confidential facility repair; specialty equipment coordination and installation; other special projects as needed. 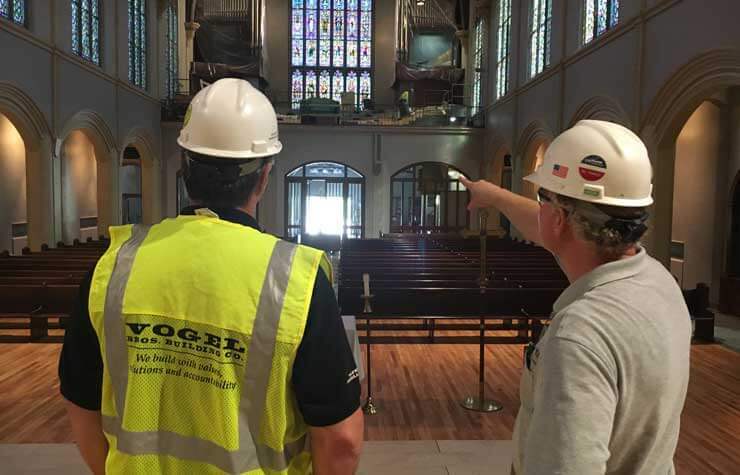 Vogel Bros. Building Co. has long embraced a lean culture that has empowered us to manage and improve our construction process. On the surface, owners may view this concept as a balance of time, cost, safety and quality that thereby increase value by focusing on the owner’s goals. But we see it as more than that. At Vogel Bros., we have identified that true and successful implementation of lean construction requires adopting a way of thinking that focuses on identifying value and eliminating wastes through continuous improvement. Lean is not a phase or a checklist item, but rather requires consistently re-imagining and evolving workflows in a Plan-Do-Check-Act cycle. If the focus is on quality (meaning we do it right the first time) then the rest of the values will fall into place. Vogel Bros. is continually making strides to improve our quality resulting in safer jobsites, reduction in rework, on-time or sooner projects, and at or below budget. This quality-focused approach to lean drives efficiency on projects, enhances collaboration and improves outcomes. It is why we stand behind Better People = Better Builders. understand how to build your space, but they believe in why you’re building your space. This is achieved through our process of Visioneering. Visioneering takes the technology of virtual construction, adds an understanding of your goals, and creates an opportunity for all project team members to effectively communicate and deliver your dream. If everyone from leadership to the craft worker understands and embraces your vision, they are intrinsically motivated to meet your goals. Seeking to understand your vision is the first step. Virtual construction, plans and specifications, and discovery meetings are just some of the additional tools we use to make sure your vision is transferred to those on the frontline. The result is a better building process that exceeds your expectations. Choosing how your project will be designed and constructed – the project delivery method – is one of the most important decisions owners make when beginning any type of construction project. Contacting us early during the project development allows us to customize these delivery methods to meet your unique needs and reach your specific project goals. Design-build is a full service method that brings the builder, construction manager, architect and engineering team under one contract. Vogel Bros. is accountable for the complete design, budget, schedule and construction of your project. We are your one-stop shop. In DB, we help you select the best team for your project. Under direction of our project managers, the team controls safety, quality, cost, schedule and final delivery. This approach benefits owners with efficiencies such as Fast-Track project delivery, greater cost savings, improved schedule control, streamlined communication and increased quality control. The CM method allows us to partner with your design team early in the preconstruction phase. Deploying our specialized knowledge, experience and expertise, we focus on the building systems and constructability to guide your project through the design and build process. As a CM, we are your advocate. Vogel Bros. will examine the materials, systems and equipment selections allowing you to make informed decisions about scope, quality, cost and schedule. The GC method is a hands-on performance process. In this method our project manager will bid out the various aspects of your project, collect the estimates, and present you with a final cost. We then construct your project per the approved bid package. As a GC, we focus on building your project per the plans and specifications. Our involvement begins after design is complete and we have provided a lump sum bid. 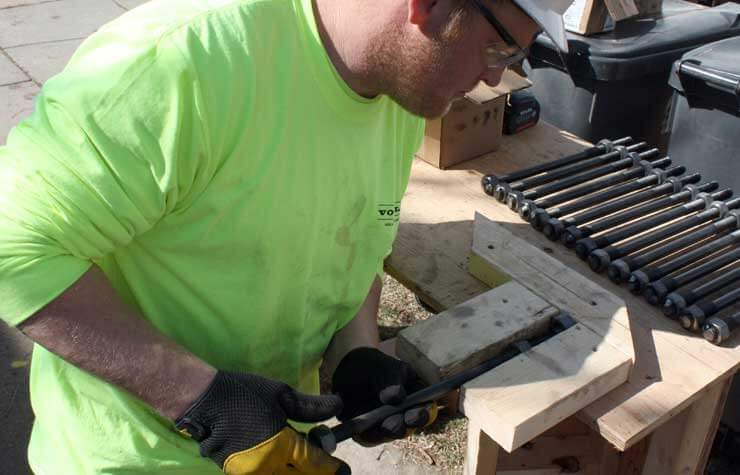 Our team manages all subcontractors and provides skilled trades such as concrete forming, rough and finish carpentry, millwork, or hardware and specialties installation. 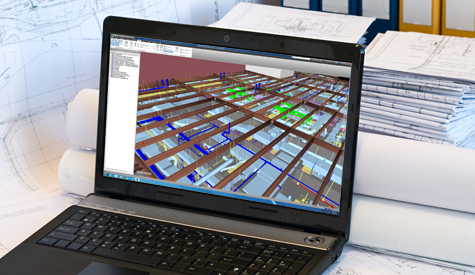 Virtual design and construction through Building Information Modeling (BIM) allows customers and team members of a project to view the digital and functional characteristics of a building before it is built. Building Information Modeling (BIM) is a digital representation that provides the owner with a realistic view of their building. It serves as a collaboration tool between the builder, architect and engineer, and allows the team to respond to changes in design, operation and layout. Industry focus is on providing value through the 3D model to better plan, design, visualize, and construct the project. However, at Vogel Bros., the BIM experts take it a step further. We use this technology to enhance the communication, accuracy and efficiency of the building by providing a more comprehensive cost analysis, systems evaluation and constructability review. Owners find this beneficial because we can work with the architects, engineers and subcontractors to eliminate unforeseen errors and detect possible conflicts before they occur, thereby saving owners time and money during construction. Whether you want a certified facility or you just want to reduce energy costs, our LEED Accredited Professionals will help identify goals and offer suggestions to best incorporate sustainable initiatives. Owners and communities are becoming more aware of the advantages of sustainable design and building practices. But it’s more than just using recycled materials and managing job site waste. Sustainability is about transforming the way we think about buildings including how they are designed, constructed, maintained and operated. Including accredited professionals on your team ensures your building will save you money and resources, will have a positive impact on the health of its users, and will use resources efficiently. Our team includes several Accredited Professionals who have been trained in offering creative solutions to minimize water consumption, reduce waste, enhance air quality, and improve energy efficiency on every project. 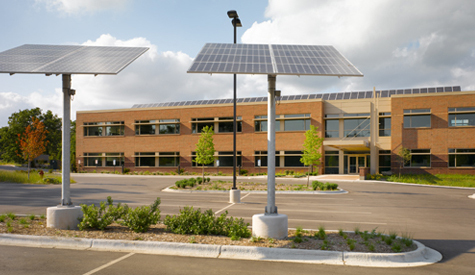 As leaders in implementing green building and sustainability practices, Vogel Bros. was the first to build a LEED certified building on UW-Madison’s campus, a certified office building in Wisconsin, and a certified pharmaceutical production facility in Wisconsin.